Monster Casino is one of the top casinos in the United Kingdom right now. The Gibraltar Gambling Commission, as well as the United Kingdom Gambling Commission, licenced this online casino so players can begin having a great time anywhere and anywhere they want. It may be one of the newly established casinos right now but it does a good job at presenting a unique kind of entertainment through its monster theme. Monster Casino is also the place where you should go to if you are searching for nice bonuses and a wide array of interesting games. The online casino partnered with reputable developers, including NextGen, WMS, IGT, and Microgaming, along with its own games. The casino operates using Nektan software, a mobile network that focuses on casino software. Setting up a new account should be easy; otherwise, gamblers will look for a much quicker way for them to play casino games. Monster Casino not only asks for standard details when you register but also rewards you for taking the time to complete the registration process. Once you are all done with creating the new profile for this online casino, you will get £5 bonus right away. Unlike other casinos out there, you are not required to make a deposit to claim the prize. It certainly is a game changer, especially now that most casinos want you to put some money in first immediately after you have your account. The bonus does not stop here though. If you want more rewards, you should certainly deposit real money to your Monster Casino account. Although it is not required, adding some cash that you can use for betting will give you the chance to get the welcome package that can go up to £500. 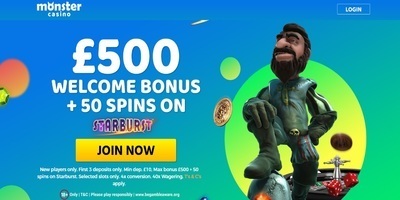 Also, you will be awarded 50 free spins that you can use on Starburst slots. After making your first deposit, you can get up to 200% bonus as long as you deposit at least £10. The maximum reward that you can get is £50 just for depositing into your account alone. Subsequent deposits will be given some bonuses as well until your third one. Aside from these bonuses, another reason why you would want to join Monster Casino is that it offers great games that you can choose from. The casino is one of the most versatile ones that you can find online today. It has a huge selection of games from different providers, including the Elk, Aristocrat, and the other big names mentioned above. In-house games are also available, such as Cave Raiders Deluxe and Best of British Deluxe. Right now, there are 400 desktop slots that you can also play on your mobile phone. This casino is one of the very few out there that have the same number of games for all platforms. Apart from slots, you can also play other casino games that you already know, such as jackpot games, baccarat, roulette, blackjack, and scratch cards. If you are searching for live dealer games, Monster Casino will surely never disappoint you as it offers more than 25 games in this category. It should be noted that this online casino does not accept PayPal. However, you can use other payment methods, such as Skrill, Visa, MasterCard, Boku, and iDeal for both depositing and withdrawals. NetEnt, NYX, Microgaming, Thunderkick, NextGen, ELK Studios, IGT, Realistic Games, Lightning Box, Rabcat, Blueprint G.